Pros: The Baby Bjorn Travel Crib has been manufactured using the finest materials, is durable and compact. It is very comfortable and lightweight. Cons: It must be checked in on flights. It is more expensive than other travel cribs. The Baby Bjorn Travel Crib Light is a high quality, lightweight, sturdy crib. 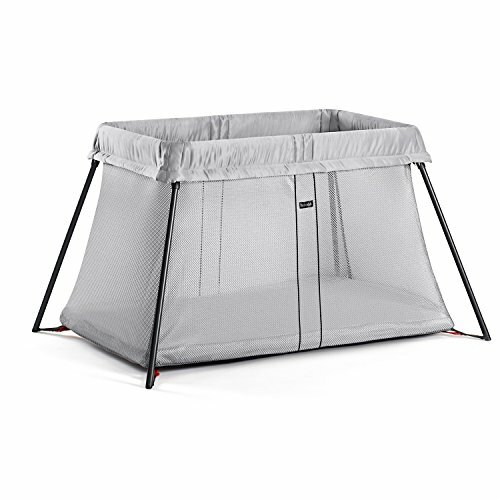 It is easy to assemble and dissemble and is the comfiest travel crib on the market. The Baby Bjorn is a compact crib that is easy to use and maintain. It is durable and should last through multiple children. This crib has been designed by experts who have taken years of research to come up with an option that is lightweight, comfortable and also offers an efficient playing area. Families that want a high quality, durable and comfortable crib. This BabyBjorn Travel Crib is great for families that travel frequently or that require a portable crib for around the home that can be used from birth. It comes with a soft mattress and carry case. Our Baby Bjorn travel crib reviews revealed a very easy to assemble and dissemble crib (check out video above) taking only moments. When folded, the mattress forms a protective layer for the travel crib. This crib is also easy to clean and maintain. The BabyBjorn Travel Crib Light is made up of lightweight equipment that is easy to carry at only 11lbs. Once you have packed it up, it is 19 x 24 x 6″ which means it can not be carried as hand luggage for flights but it does fit into a suitcase and will easily fit into the trunk of a car. This travel crib comes with a stylish carry bag. This crib is the comfiest travel crib. It comes with a nice padded mattress which is sure to please even a picky baby. The walls are made with breathable mesh. It can support your baby from the day they are born until they are about three years old. When it is unpacked, it is 32 x 44 x 24″ deep. This crib meets all safety standards, including the highest safety standards for the sheets. It is very sturdy when assembled. The Baby Bjorn Travel Crib Light comes in silver and blue. You can also buy sheets for it. Extra space in the accompanying bag where you can fit sheets or extra diapers. You can also buy extra sheets. It can not be checked into flights. It is more expensive than other travel cribs. The Baby Bjorn Travel Crib Light is a superb travel crib and an excellent choice for parents who want the best,most comfortable travel crib on the market and aren’t worried about being able to carry it on to a plane as a hand luggage.